The Catbird (Dumetella carolinensis) - also known as Common Catbird, Grey Catbird or Northern Catbird - is in the Family: Mimidae, the Mockingbird family. Mockingbirds only constitute about half the total species in that family; the rest are Thrashers and Catbirds. A chunky, medium-size bird, it is larger than Thrushes yet smaller than Thrashers. Its presence in our backyards helps us connect with the natural world. As we watch them in our gardens, we notice that they are quite fond of the birdbaths we place there; whole families will bathe communally. Given its name in 1709, the Catbird is known for its jaunty tail flipping and vigorous, musical voice. Since it spends most of its time on land, its wings and wing musculatures have experienced decreased development; however, its terrestrial habitats have led to a corresponding improvement in its running ability. The Catbird’s ways are solitary and territorial, its behavior defensive. Although not as colorful as other songbirds, the Grey Catbird is far more adaptable than the others. While most songbirds’ livelihood is imperiled by the loss of natural habitats, this bird is the exception to that rule; it has developed the ability to adapt to nearly every type of habitat. 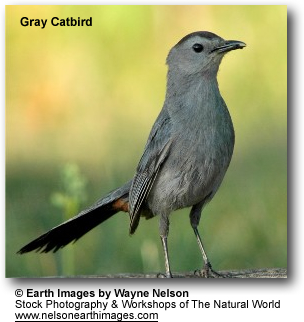 The Catbird is well suited to crepuscular activity (active primarily during dawn and dusk). The Grey Catbird dwells in its hiding places deep in the understory of the dense thickets in the eastern woodlands and residential areas. This layer of small trees and bushes, below the level of the taller trees in a forest, offers protection from predators and provides abundant food. 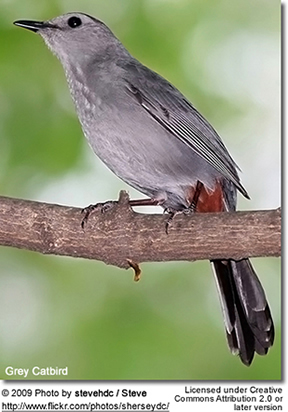 The Grey Catbird has an extensive range—from southern Canada, east and central US to the Gulf states. It resides year-round in the northern parts of the tropical southern states from Louisiana east to Virginia. Catbirds are nocturnal migrators; those in higher latitudes usually move to warmer regions for the winter. It spends the colder weather mainly in southern parts of the southern states, Mexico, northern Central America, Panama, and the West Indies. It is a casual vagrant during fall and winter in the Southwest and along the Pacific coast. The western birds are limited by the loss of riparian, or seaside, habitats. Secretive but energetic , the Catbird can be found hopping and fluttering from branch to branch within the intertwining tangles of vegetation. Males will sit atop shrubs and short trees and sing their songs. Aware of their prey status, Catbirds are reluctant to fly across open areas, preferring quick, low flights over vegetation. Unlike almost all neotropical migratory songbirds, the Catbird has adapted well to the widespread urban and suburban human habitats. They do well in thick undergrowth, brush, thorn scrub, and suburban gardens. Look for Grey Catbirds in dense tangles of shrubs, small trees, and vines, along forest edges, streamside thickets, old fields, and fencerows. In natural areas, Catbirds are fond of wet, densely vegetated, shrubby habitats such as bogs, streamsides, and between fallen trees. These small, constantly changing, disjointed patches of land can be found dotted across the landscape and are frequently situated between other habitats. Although these areas have abundant food, cover, and water, competition for resources is fierce, and there is no dearth of predators. In order to survive in these habitats, birds have needed to adapt to the changing environment; they must deal with frequent nest predation and parasites. They also must learn to forage on a wide variety of seasonally available foods. Armed with these adaptations, Catbirds are well prepared for the disturbed habitats of the 21st century's fragmented landscape. Somewhat smaller than a Mockingbird in size—9 in. 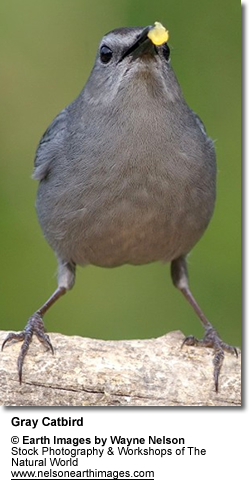 (23 cm) in length—the Catbird is similar in body shape. It is fairly large for a songbird. The adults weight around 35-40 g (1.2-1.4 oz). At first glance, it would seem the Catbird’s plumage is only varying shades of gray, but the undertail coverts and vent areas are a lovely chestnut to rust or rufous-brown color. Slate gray predominates, but the wings and tail are darker, and there is a slim, black cap on the crown which leads into the darker nape and black bill. The remiges and rectrices (wing and tail feathers) are also black, and some sport white borders. The slim bill, eyes, legs and feet are also nearly black. This songbird’s tail is long, and its white-edged wings are short, broad, and rounded. The bill is somewhat long and straight, and there is white above it, between the eye and the black cap. The underparts are often spotted or streaked. It is fairly long-legged. No other North American bird such uniformly dark gray plumage. Males and females are monomorphic, even during breeding season. The only way to tell the difference is by observing their behavior during breeding season. Juveniles are even more plain in coloration, and their undertail coverts are closer to a buff shade. Juveniles are similar to adults in plumage. Whether solitary or in pairs, Catbirds hunt on or near the ground and in or near brush growth. They love insects, fruit, seeds, and various invertebrates, including spiders, centipedes and worms. Other favorites are crickets, caterpillars, cicadas, grasshoppers, beetles (especially Japanese beetles and June beetles). While many other songbirds rely heavily on insects for food, the Catbird’s diet is more extensive. Even during the breeding season, when most songbirds eat only insects, the Catbird gets as much as 20% of its diet from fruit. The fragmented habitats in which the Catbird dwells provide a seasonal succession of berries and fruit. During the changing seasons, the Catbird enjoys the food and shelter on the following bushes and trees: Red Mulberry, Serviceberry, Blackberry, Black Cherry, Dogwood, Viburnum, Bayberry, Wild cherries, Sumacs, Elderberries, Mountain ash, Highbush blueberry, Wild Grapes, Hackberry, and the American Holly. Most Catbirds winter in the tropics of Mexico and Central America, where fruit is quite abundant. About 80% of the Catbird's winter diet is composed of fruit. To find insects, necessary for the growth of baby Catbirds, foraging is done in a range of niches. They eat a variety of foods from many different locations. 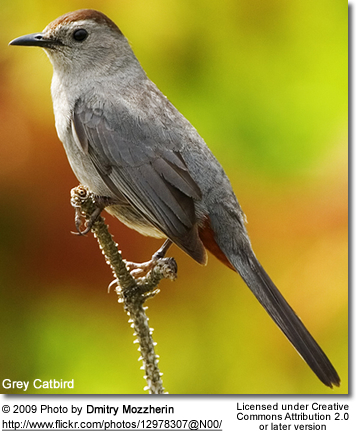 Catbirds will forage on the ground, on lawn edges, in shrubs, and even in the treetops to find ants, beetles, caterpillars, grasshoppers, and spiders. Catbirds are not as specialized as many other songbirds and are better suited to finding food in habitats that have been disturbed by people. In addition, Catbirds are one of the few neotropical migratory songbirds that will use bird feeders. Although their bills are too thin to crack open seeds, they will eat halved oranges, raisins, peanut butter, and fruit-flavored suet. Homeowners can put out fleshy fruits, such as chopped-up oranges, raisins, blackberries, blueberries, raspberries, cherries, plums, elderberries, gooseberries—any fruit will do. Growing bushes and trees which produce this food is an extra treat for them. Keep everything close to shrubs, though; Catbirds don’t like to be more than a hop away from a thicket. This songbird’s breeding territories range from southern British Columbia to Nova Scotia, south to eastern Oregon, central Arizona, Texas, and into the central parts of the Gulf states. The females appear at the breeding ground just after the males, and courtship antics begin. The male sings, pausing to dash off in pursuit of the female. He struts with lowered wings and erect tail, wheeling around and exhibiting the chestnut patch on its undertail coverts. The Catbird nests in dense thickets along the edge of mixed woodland. In the West, nests are constructed along willow- and alder-lined montane streams. Both the male and female Catbird build a bulky, cup-shaped nest in low bushes or trees or on the ground. It is composed of twigs and lined with rootlets, bark shreds, hair or grass. After the male brings the supplies to the female, she masses it all together, low to the ground, always in thick cover or even in a tangle of vines within the cover. Although these nests are capable of lasting for several seasons, normally they will only be used once. The female lays 2-6 eggs, green to blue or buff, and usually spotted. He will bring food to her and guard the nest when she leaves to feed herself. The male also cares for the young but rarely incubates the eggs. Larger clutches are generally found in higher latitudes and smaller ones in tropical regions. After 12-13 days of incubation, the altricial young hatch and are fed and cared for by both parents. The sparsely down-covered nestlings remain in the nest another 13-19 days, after which the fledglings leave. Most other songbirds lay only one clutch per season, and if a predator eats the eggs or young, the parents may have to wait until the following year to try again. But Catbirds are unusual in that respect—they will attempt two or more nests in a season. This gives them a much better chance to fledge more young in a season than other migratory songbirds. Catbirds hide their nests extremely well to defend them against predators. The nests are often hidden in extremely dense shrubbery with the rough exterior of twigs and leaves camouflaging the colorful bluish-green eggs inside. As do other passerines, the Catbird must deal with nest parasites. But they have an advantage when dealing with the Brown-headed Cowbird. These birds are the bane of many songbirds and are increasingly common in agricultural and disturbed areas. They do not build nests of their own but lay their eggs in the nests of unsuspecting songbirds. The Cowbird's eggs are brooded just like the mother's own eggs, and the young are raised to adulthood. Unfortunately, because of their size, the Cowbird’s offspring are frequently raised at the expense of the host species’ young. The host birds often do not survive since the Cowbird babies grow quickly and demand more food. The Catbird’s advantage is that they can tell the difference between the Cowbird’s eggs and their own. Gray Catbirds can identify cowbird eggs and will eject them from the nest. By not raising cowbird young, the Catbird is able to give all of its gathered food to its own babies. They are strong, versatile singers and fine imitators of other songs or sounds. Not limited to their replication of the songs of other birds, they are even capable of imitating mechanical sounds! Amazingly enough, its well-developed songbird syrinx (voice box) is able to make two sounds at the same time—a most unusual feat in the bird world! The alarm call resembles the quiet calls of a male mallard. A Gray Catbird's song is easily distinguished from that of the Northern Mockingbird or Brown Thrasher. While the Mockingbird repeats its phrases or "strophes" 3 to 4 times, and the Thrasher usually repeats them twice, the Catbird sings most phrases only once. The Catbird's song is usually described as more raspy and less musical than that of the Mockingbird. Since Gray Catbirds are relatives of Mockingbirds and Thrashers, they share that group’s vocal abilities, copying the sounds of other species and stringing them together to create a new song. In contrast to the many songbirds that choose a prominent perch from which to sing, the Catbird often elects to sing from inside a dense thicket or in a small tree, where it is obscured from view by the foliage. Concealed from predators in its brush enclosure, the Catbird can get comfortable and sing to its heart’s content. With its tail held down, body feathers fluffed, and wings drooping at its sides, the Catbird exuberantly sings a series of musical whistles and catlike meows, interspersed with imitations of other birds' songs and animal noises, such as those of tree frogs. Early to rise and late to bed, the Catbird begins its song before dawn, while it is still dark, and might be heard well after dusk and into the night; it is one of the last birds to settle in for the night.